The Wall Street Journal is reporting that Warner Brothers president of worldwide production, Greg Silverman, has confirmed that the studio is planning to follow 2016's Man of Steel sequel with a Justice League movie, to be directed by Zack Snyder. "It will be a further expansion of this universe," confirmed Silverman. "'Superman vs Batman' will lead into 'Justice League.'" The Man of Steel sequel, tentatively titled Batman vs Superman (or vice versa if Silverman's quote is accurate) begins shooting next month, with Henry Cavill reprising his role as Superman, Ben Affleck as Batman and Gal Gadot as Wonder Woman, with all three likely to return for Justice League. While it has yet to be confirmed which other members of the superhero fighting force will be involved, stage actor Ray Fisher was recently cast in the role of Cyborg, who will likely have a small role in the upcoming feature. 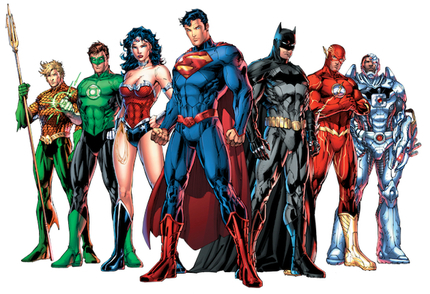 A script for the Justice League film is currently in development at Warner Bros, so it is unlikely that we'll see a film hitting screens before 2018 at the earliest, but this news is a clear indication that the studio is finally galvanizing its DC Comics properties into action, in the hope of competing with the incredible successes of Disney/Marvel with their Avengers series. Silverman refused to confirm if any other members of the League would be getting their own spin-off movies, but Sue Kroll, president of worldwide marketing, made some encouraging noises about a possible Wonder Woman movie. "That is our hope. With the right script, that could be viable. The world is ready for her." Damn right we are. I sure hope WB knows what they're doing. Nothing changes the fact that this entire cinematic universe they are doing was an afterthought, only AFTER seeing the success of "The Avengers." Remember, they were still filming the first "Man of Steel" before "The Avengers," was ever released. The same can't be said for the MCU!